Neill Blomkamp's new film "Elysium" is as good as we would expect from the creator of his similar first effort "District 9". This is saying something. The film is exciting, visually intriguing, well-paced, and boasts a stellar cast. 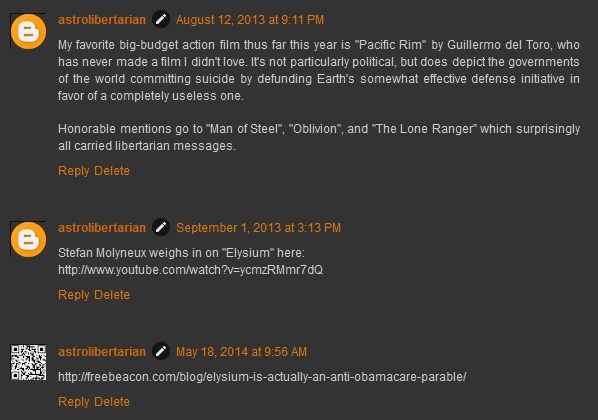 "Elysium" is also a ridiculously over-the-top Left-wing propaganda machine. Probably not since Justin Timberlake played a future Robin Hood in "In Time" has there been an action film quite so saturated with Neptunian political ideology. Blomkamp openly espouses Left-wing views on economics, healthcare, and immigration as gospel truth. This makes "Elysium" an excellent case study of the Leftist (Neptunian) view of the world. Marxism is the film's unspoken religion: the Venus-Neptune dynamic is in full display. Wealth (Venus) is something that only exists in another world (a Neptune effect), the satellite Elysium where "the rich" live a life of leisure alongside the ruling government. The flip side of Venus-Neptune is also everywhere in that theft is presented as the primary means of attaining wealth. The film implies that wealth is stolen from the poor by the rich, by depicting the working class as slaves and by asserting their moral right to "take back" the magical healthcare machines that only exist on Elysium. The heroes of the film are also all thieves, from Matt Damon's retired car thief to the high-tech robbery ring he teams up with to overthrow the system: that these heroes would have to have been stealing from their fellow earthbound proletarians never comes up. Nowhere in this universe does one "get ahead" by honestly creating goods and services others want and voluntarily exchanging them for goods and services one values more. As we would expect from a Neptunian worldview, the world in "Elysium" is actually impossible. Earth here is a giant overpopulated slum with no greenery in sight, like a global Rio de Janeiro. Impossible: large populations require a large agricultural apparatus to survive. There would either have to be giant non-urban regions for farming, or the cities themselves would have to be giant greenhouses. If the resources on Earth were sufficient to sustain the population, then the word "overpopulation" should actually read "uncomfortably crowded but not fatally so". If not, the excess human population would quickly starve until the number of humans no longer stressed the food supply. In the real world, only agrarian, pre-industrial societies have burgeoning populations. All post-industrial societies on today's planet are actually declining in population. According to current trends, world population should grow for only few more decades, and then shrink thereafter. Perhaps the world of "Elysium" actually has a giant government welfare system that rewards having babies: with modern automation many of the traditional economic incentives for having children (more hands on the farm) are already moot. Second, keeping the magical healthcare machines for exclusive use on Elysium would be idiocy for any ruling class intelligent enough to retain their power. As soon as the rabble became aware of the machines, the logical thing to do would be to make a number of machines available on Earth, for a price. This would reduce the danger of incursions from Earth to Elysium by "the poor", and cause the rabble to fight/compete amongst themselves for access rather than attacking the elite. Third: Matt Damon's boss forcing him into a high-radiation area of the robot factory to fix a malfunction, thus causing Damon the fatal illness which drives him to seek Elysium. This is an emotionally affecting moment. It is also pure idiocy: we are in a robot factory. An effective capitalist boss would have seen a choice between sending Damon and losing an economically effective worker, or sending a robot and losing nothing. These kinds of decisions are more common in Communist systems where there is no profit motive and therefore no incentive to preserve resources (human or otherwise), than in capitalism. Fourth: the high-tech thieves that Damon allies himself with aren't "poor" by any reasonable definition. They have high-end computer systems rivaling those of Elysium, a seemingly endless supply of weapons, a state-of-the-art exoskeleton for Damon to wear, and enough space shuttles that they feel comfortable sending them to Elysium knowing full well that they will be destroyed. This rather undermines the "rich Elysium elites versus poor Earth people" dichotomy. The proletarian trappings these folks display is not so much economic limitation as it is fashion statement. Finally: Elysium itself does not make economic or logistical sense. It could not possibly be self-sustaining if its inner ring is just a giant country club dotted with mansions and pools, as it is in the film. This would require that food, manufactured goods (including those wonderful healthcare machines), and possibly even air and water all be regularly shipped from Earth into space. Everything that makes it paradise could more cheaply, easily, and safely be replicated on Earth in a segregated community -- such as the Earth already has. The entire premise of the film falls apart under scrutiny because the Earth-dwellers would have access to everything they need to create paradise without going into space. In a plausible universe, the earthbound would either be choosing not to improve their own lot, or a Communist-style control system would be forcibly preventing it. The latter scenario is one we actually do see in real life -- in this case the problem is not rich people living away from the herd but Communist-style control. "Elysium" slaps the viewer in the face with the US/Mexico immigration issue by making most of the protagonists Spanish-speaking Latino and all of the villains white or Asian, and by making conspicuous use of terms like "undocumented", "citizen", and "legal" when referring to people. Libertarians generally favor open immigration, as do I, but we see the abolition of the welfare state as a precondition for making open immigration economically viable. Alex Jones frequently points out that Mexico actually possesses far greater natural resources than does the US. Like the people of Earth in "Elysium", the people of Mexico might better serve themselves in the long term by emulating the systems that made America relatively more attractive than by bringing their problems with them across the border. Immigration and racial issues often show up in astrology through the Moon and/or the Fourth House, in combination with Neptune and the Nodes. The dystopia of "Elysium", presented as an argument for Leftist/Neptunian policy, could only have been created by a Leftist/Neptunian thought process. The film's proposed solution, the forcible appropriation of wealth from the "haves" to the "have nots", is actually the rationale under which real-life tyrannies of this sort rise to power. This is typical of Neptunian thinking: misdiagnosing social problems or even inventing problems that don't exist, and "solving" them with solutions that actually create and perpetuate the problems. Coming up: the unsurprising astrological charts for writer/director Neill Blomkamp and star Matt Damon.